Operators: Maksimov L., Filatov I. On the visit of the Laotian Party and Governmental Delegation headed by the General Secretary of the People Revolutionary Party Central Commitee, Prime Minister Keyson Fomvihan. 1h. The history of the national liberation struggle of Laos. 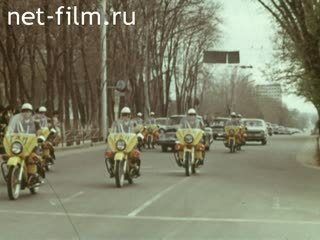 Visit the Party and government delegation of Laos in the USSR. Sightseeing tour of the capital. The talks in the Kremlin and the signing of the Soviet-Laotian documents. Visit the delegation of the Lao plant them. 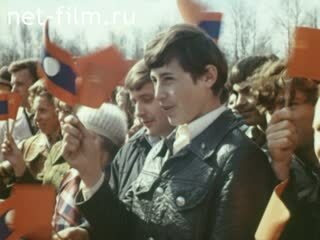 Likhachev rally. 2h. Stay in Leningrad: sightseeing, visiting Electrosila. Visit of the delegation in the city of Alma-Ata. Sightseeing. Visit a textile mill, the Republican VDNH. Laos countryside, the village; the printers work in a cave; report for the city of Vientiane (streets, historical monument). Moscow: Kremlin towers, Moscow River, Red Square. In the Palace of Congresses, delegates Seele 25 Congress of the CPSU; LI on the podium Brezhnev; supports the head of the Lao delegation General Secretary of the Lao People's Revolutionary Party comrade Cason Fomvihahn. Cheering in the hall and the podium. In Moscow airport Lao delegation headed by the Prime Minister of Laos K. Phomvihane, meet a member of the Politburo, Secretary of the CPSU, MA Suslov, Politburo member, Chairman of the USSR Council of Ministers AN Kosygin, a member of the Politburo of the CPSU Central Committee, Minister of Foreign Affairs of the USSR AA Gromyko and other officials; solemn ceremony of the meeting. Lao delegation lays a wreath at the Mausoleum of VI Lenin and the Tomb of the Unknown Soldier. Member of the Politburo comrades MA Suslov, AN Kosygin, AA Gromyko, and other officials and members of the Lao party and government delegation headed by Comrade Phomvihane in the Hall of the Kremlin in the negotiations; at the signing of the Soviet-Lao documents. Shop car factory Likhachev: workers on the assembly of the car. Meeting at: K. Fomvihahn act, representatives of the workers of the plant. Leningrad; ice drift on the Neva, the Winter Palace. K. Fomvihahn, members of the Lao delegation in Smolny (visiting the study VI Lenin, assembly hall); to cruiser "Aurora" (Cason someone give shape Soviet sailor, Comrade Cason Fomvihahn gives sailors cruiser memorable pennant); Victory at the Memorial, dedicated to the Heroic Defenders of Leningrad (fragments of the memorial); Piskaroyvskoye Memorial Cemetery (laying a wreath, fragments of reliefs memorial wall sculpture "Motherland"). The members of the Lao delegation at the Leningrad plant "Electric power": pass through the shop, Comrade Fomvihahn greets workers. Working for the installation of the turbine. Lao delegation meeting at Almaty airport, atmosphere Politburo member, First Secretary of the Communist Party of Kazakhstan, DA Kun, chairman of the Council of Ministers of the Kazakh SSR Ashimov. Report on the streets of Alma-Ata. Lao delegation during a friendly meeting of the Central Committee of the Communist Party of Kazakhstan, DA says Comrade Kun. The members of the Lao delegation laid flowers at the monument to Soviet soldiers who died in World War II. Laotian guests at the Palace of Pioneers; dancing children in traditional costumes. Lao delegation at the Alma-Ata textile mill (pass through the shop, visiting the booth with samples of fabrics produced). Laotian guests at the republican exhibition, examine samples of agricultural machinery. Delegation in one of the production and technical schools of Alma-Ata (in the classroom during class). Lao delegation visits the greenhouse on the farm Michurin; flowering trees, mountain stream, tea plantation. Laotian guests plant a tree. Lao delegation says goodbye at the Moscow airport to the mourners (comrades AN Kosygin, MA Suslov and others).